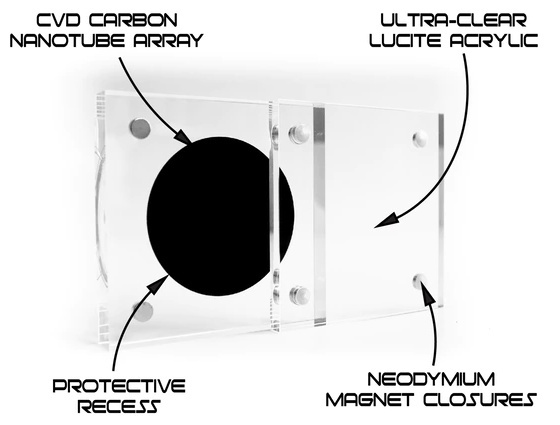 Created by [Simon], a designer in the UK, this small carbon nanotube array is described as “A simulated black hole” because the surface absorbs 99.9% of the visible light that hits it. Protected by a clear acrylic case, the sample of the material makes a circle that’s so black it gives the impression you’re looking into deep space. Unfortunately, no time-dilating gravitational forces are included at any of level of support in the ongoing Kickstarter campaign; but considering it was 100% funded in just a few hours, it seems like most people are OK with the trade-off. [Simon] is well aware of the ongoing war between different methods of creating the “Blackest Black”, and he thinks he’s put his money (and by extension, his backer’s) money on the winner. Singularity is using a similar technology to the exclusively-licensed Vantablack, rather than a super-dark paint like “Black 3.0”. In fact he’s so confident that Singularity will appear darker than Black 3.0 that he mentions a head-to-head comparison is currently in the works. If there’s a downside to the carbon nanotube array used in Singularity, it’s that you can’t actually touch it. [Simon] warns that while the acrylic case is only held together with magnets and can be opened for more careful inspection, actually touching the surface is absolutely not recommended. He says that even dust getting on the material is going to adversely effect its ability to absorb light, so you should really keep it buttoned up as much as possible. While the Singularity looks like an interesting way to experience near perfect blackness, the concept itself is far from a novelty. A material that can absorb essentially all the light that hits it has important scientific, military, and of course artistic applications; so figuring out how to pull it off has become a pretty big deal. Traditionally, capacitors are like really bad rechargeable batteries. 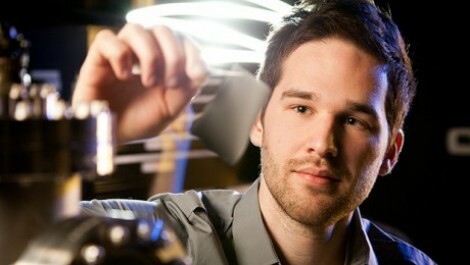 Supercapacitors changed that, making it practical to use a fast-charging capacitor in place of rechargeable batteries. However, supercapacitors work in a different way than conventional (dielectric) capacitors. 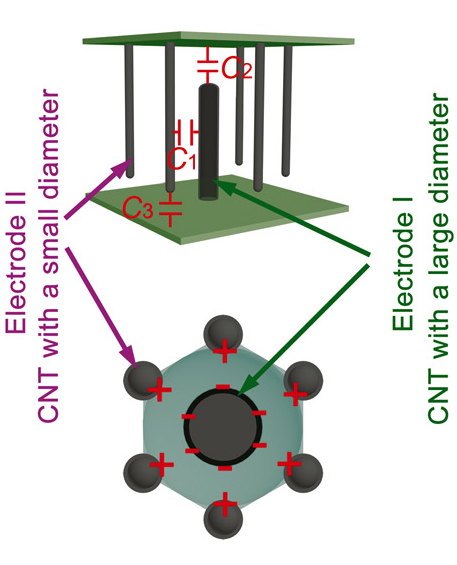 They use either an electrostatic scheme to achieve very close separation of charge (as little as 0.3 nanometers) or electrochemical pseudocapacitance (or sometime a combination of those methods). In a conventional capacitor the two electrodes are as close together as practical and as large as practical because the capacitance goes up with surface area and down with distance between the plates. Unfortunately, for high-performance energy storage, capacitors (of the conventional kind) have a problem: you can get high capacitance or high breakdown voltage, but not both. That’s intuitive since getting the plates closer makes for higher capacitance but also makes the dielectric more likely to break down as the electric field inside the capacitor becomes higher with both voltage and closer plate spacing (the electric field, E, is equal to the voltage divided by the plate spacing). [Guowen Meng] and others from several Chinese and US universities recently published a paper in the journal Science Advances that offers a way around this problem. 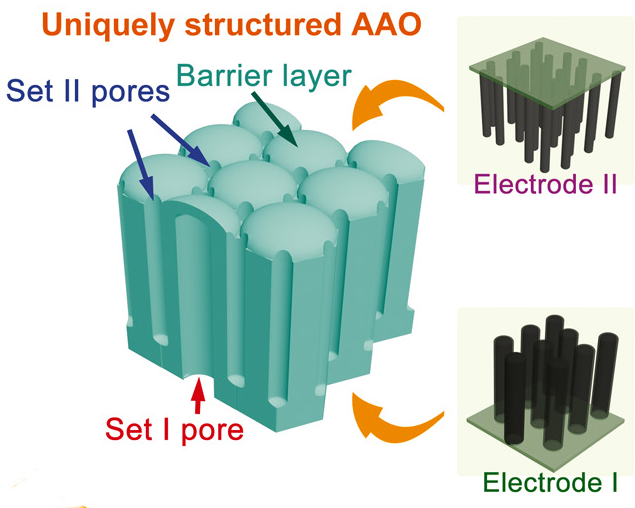 By using a 3D carbon nanotube electrode, they can improve a dielectric capacitor to perform nearly as well as a supercapacitor (they are claiming 2Wh/kg energy density in their device). The capacitor forms in a nanoporous membrane of anodic aluminum oxide. The pores do not go all the way through, but stop short, forming a barrier layer at the bottom of each pore. Some of the pores go through the material in one direction, and the rest go through in the other direction. The researchers deposited nanotubes in the pores and these tubes form the plates of the capacitor (see picture, right). The result is a capacitor with a high-capacity (due to the large surface area) but with an enhanced breakdown voltage thanks to the uniform pore walls. To improve performance, the pores in the aluminum oxide are formed so that one large pore pointing in one direction is surrounded by six smaller pores going in the other direction (see picture to left). In this configuration, the capacitance in a 1 micron thick membrane could be as high as 9.8 microfarads per square centimeter. For comparison, most high-value conventional capacitors are electrolytic and use two different plates: a plate of metallic foil and a semi-liquid electrolyte. You can even make one of these at home, if you are so inclined (see video below). We’ve talked about supercapacitors before (even homebrew ones), and this technology could make high capacitance devices even better. We’ve also talked about graphene supercaps you can build yourself with a DVD burner. It is amazing to think how a new technology like carbon nanotubes can make something as old and simple as a capacitor better. You have to wonder what other improvements will come as we understand these new materials even better. Using multiwall carbon nanotubes, researchers at Georgia Institute of Technology have created what they say are the first optical rectennas–antennas with rectifiers that produce DC current. The work could lead to new technology for advanced photodetectors, new ways to convert waste heat to electricity and, possibly, more efficient ways to capture solar energy. Light as air, stronger than steel and more flexible than rubber. Sound like something from the next installment of the Iron Man series? [Tony Stark] would certainly take notice of this fascinating technology. Fortunately for us, it does not come from the studios of Hollywood, but instead the halls of the NanoTech Institute at the University of Texas. Professor [Ray Baughman] and his team of scientists at the NanoTech Institute have developed a type of artificial muscle through a process of making aerogel sheets by growing carbon nanotubes in a forest like structure. Think of a vertical bamboo forest, with each bamboo stem representing a single carbon nanotube. Now imagine that the individual bamboo stems were connected together by much smaller horizontal threads. So that if you dislodge the bamboo and began to pull, the threads would pull the others, and you would get this sheet-like structure. These aerogel sheets of carbon nantubes have some truly science fiction like properties. They can operate from 1,600 degrees centigrade to near absolute zero. If you inject a charge, each nanotube will be repulsed from one another, expanding some 220% of the sheet’s original size. Your muscles do this at roughly 20 – 40%. Stick around after the break for a video demonstration of these carbon nanotube aerogel sheets being made and demonstrated. Thanks to [Steven] for the tip! It’s the stuff that Science Fiction is made of: an elevator that climbs its way into space rather than needing a rocket to get there. Can it be done? No. But this Kickstarter project aims to fund research that will eventually make a space elevator possible. They’re already way over their goal, and plan to use the extra funds to extend the reach of the experiments. A complete success would be a tether that reaches into space, held taught by a weight which is pulled away from earth by centrifugal force. That’s not really on the radar yet (last we heard humans weren’t capable of producing a substance strong enough to keep the tether from snapping). What is in the works is a weather balloon supporting a ribbon which a robot can climb. The team isn’t new to this, having built and tested several models at University and then in a start-up company that closed its doors a few years ago. Now they’re hoping to get a 3-5 kilometer ribbon in the air and to build a new robot to climb it. For now we’ll have to be satisfied with the 1000 ft. climb video after the break. But we hope to see an Earth-Moon freight system like the one shown in the diagram above before the end of our lifetimes. Someday you may be able to use your crotch or armpits to recharge that cellphone. Heck, maybe there won’t even be a battery, just a capacitor which gets its juice from Power Felt, a fabric that converts body heat to electricity. Now we mention the nether-regions because it’s funny, but also because it makes the most sense. Researchers have developed a fabric containing carbon nanotubes used in a way that generates electricity based on a temperature differential. We figure the areas on the body that have high heat loss would be the most efficient locations for the fabric since it is currently extremely expensive to produce (the hope is that mass-production would reduce cost by orders of magnitude). So we think battery-charging briefs are a definite possibility. What we see here is a nano-scale Peltier electricity generator. It’s the same concept as this candle-based generator, except the increased efficiency of the Power Felt lets your wasted body heat take the place of the flame. There’s a white paper on the topic but you can’t get at it without surrendering some [George Washingtons].